Pop quiz, you're riding down the road minding your own business when all of a sudden you crash and seriously bend a wheel on your faithful ride to the point that it looks like a taco. What do you do? Let's say that you have no tools, you're miles away from home, there is not a bike shop anywhere in site and no way to get a lift home. Supposing that you have survived the incident intact and you don't require ambulance transport, you're on foot and you need to get back home. At this point, you have nothing to lose and everything to gain. 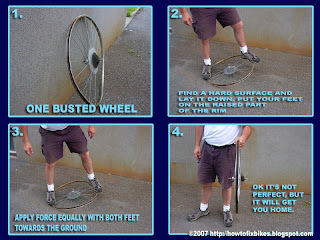 Your wheel is busted and you'll have to replace it anyway. You can work the wheel roughly back into shape by putting it on a hard surface, place your feet on the raised side of the "taco" and with both feet, jump firmly on the wheel to press it down. It should come back into a rideable shape. Do some more spot presses if you have to. The idea of this maneuver is not to have a perfect wheel, you'll have to replace it anyways, but to bring it back to a decent shape so you can ride back home slowly. At this point, the wheel will do it's job, but it won't be balanced and safe. So avoid any serious speed, especially downhill. Let's face it, the worst ride beats the best walk! In the images, I used a wheel without a tire. Wheels with a tire usually come back in pretty good shape if I refer to the few times that I actually had to do this. Don't kid yourselves after this, the rim and spokes are shot, so go to your local bike shop and get another wheel once you get home safely. Good information to know. I never even thought of this. I didn't even know this was even possible. I've had spokes break on me before and had to call for back up (my wife in the truck). This is not the first time I've found myself poking around on your blog. Sometimes the obvious stuff is not obvious. Glad I helped you out to open your mind. I'm a great believer in thinking outside the box. Hi gerry, thanks for the site, i would like to buy the bike stand you posted thats around 60$! where can i buy it?! could i have an adress! The bike stand in question died on me a few weeks ago. A good place for decent priced bike stands is Mountain Equipment Coop at the Marché Central location. Good prices on tools as well. Good luck. I´ve found out you can actually do this with out taking the wheel of the frame esp. with the rear one. I once accidenttly wnet off a 2 feet drop while giving someone a lift with my 28" singlespeed bike. The wheel was quite untrue to begin with and after the impact it "tacoed" aprox 20 cm from the center. The tric to straighten it while still on the frame is to roll it so the bend faces away from you, then put your feet at the axelbolt and while holding the saddle and handlebar stomp it straight. Thank you for that additional information Arvid. Is dere any way to repair? The bike shop answer is unfortunately on the money. You can always tweek a bent rim wheel, but the best thing to do, besides wacking it back into almost good shape with a hammer, is to replace the rim. Spend the bucks on the new rim is my recommendation, especially if you ride that bike hard. I'd like to post the picture you have of a tacoed wheel on my blog, with attribution of course. Is that OK with you? I'd also post a link to your site in my post. Sure thing Steve, go right ahead. Did you know you can shorten your long urls with AdFly and get money for every visit to your shortened links.